That viewer is me, is you, is us: readers of Asymptote, a journal offering the freedom of infinite interpretations. Thanks to the hard work of Duncan Lewis, Jacob Silkstone, József Szabo, Marina Sofia, Emma Page, Kyrstin Rodriguez, Giorgos Kassiteridis, Tiffany Tsao, Alexander Dickow, and myself, November 2017 sees the launch of the Asymptote Book Club, a sustainability initiative meant to support independent publishers of world literature while also helping Asymptote stay afloat. By January 2018, after an intensive marketing campaign (e.g., I answer some questions about the Book Club here), we succeed in attracting more than 120 subscribers. In addition, our seventh anniversary is greeted by two important milestones, both to do with the number 100: We cross the 100 mark for number of team members on our masthead, and, with the addition of Amharic and Montenegrin in the Winter 2018 edition, we have gathered work from exactly 100 languages in our archive of world literature! In his interview with Asymptote that we ran in this issue, Lithuanian editor Marius Burokas laments that, as with many peripheral literatures, Lithuanian writing “can only speak of a one-way influence” from English at the moment; that said, Lithuanian literature is by no means a “small [one].” “There are only writers who are not good enough,” he observes wryly, “or writers who are not publicized enough.” This speaks to the very heart of Asymptote’s mission, which is why we have whole teams (from social media to graphic design) set up for the purpose of marketing the work that we’ve been entrusted with, as detailed in an earlier post where I released this publicity report. Where we direct our efforts applies to where we direct our funds as well: For instance, by January 2018, the money we’ve cumulatively thrown at Facebook promotion alone has exceeded $10,000 USD. It’s not only money that I’ve staked personally; in our eight years, I’ve supported almost every single Facebook post in order to encourage other team members as well as our own readers to engage with Asymptote’s feed, all so that we can be a more powerful advocate for so-called “small literatures.” Cruelly, then, around this time, because of the backlash from Russian interference of the 2016 US elections, Facebook deprioritizes social media pages like ours, hurting our ability to connect authors with new readers. I know because I was still supervising the new English Social Media Managers (as well as the Assistant Director of Outreach—whose day job was in social media analytics—I was hoping to install as a permanent team member) from the hospital ward where I was quarantined after radioactive treatment, anxious as much about our falling social media engagement as my own Geiger counter reading (which on the other hand refused to fall as quickly as the doctor and I had hoped, thereby prolonging my hospitalization and resulting in a larger medical bill). Here to introduce the Winter 2018 issue is Brazil editor-at-large Lara Norgaard. 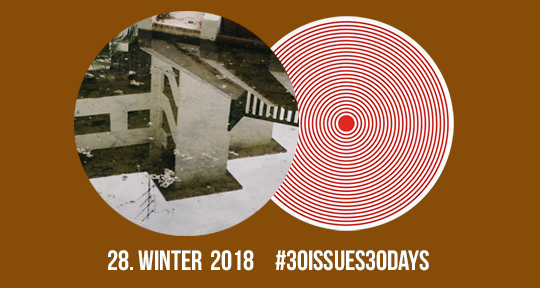 Two parallel snapshots of everyday scenes spliced by double-circle frames form the cover image of Asymptote’s Winter 2018 issue. A woman calmly pushes a stroller on the left, mirroring a different woman on the right who wears dark sunglasses and stares directly into the camera, allowing us to only guess at her penetrating gaze. In these cover photographs, the edition’s guest artist, Elephnt, captures one of its central components: the way each contribution takes a powerful approach to perspective. The authors in this issue all write with a particular and intense gaze that confronts or perhaps commiserates with the reader.